More than a billion people eat fewer than 1,900 calories per day. The majority of them work in agriculture, about 60 percent are women or girls, and most are in rural Africa and Asia. Ending their hunger is one of the few unimpeachably noble tasks left to humanity, and we live in a rare time when there is the knowledge and political will to do so. The question is, how? Conventional wisdom suggests that if people are hungry, there must be a shortage of food, and all we need do is figure out how to grow more. In a squat beige Seattle office building, the world’s largest philanthropic organization has been thinking along the same lines as the president. The Bill and Melinda Gates Foundation, with an endowment of more than $30 billion, has embarked on a multibillion-dollar effort to transform African agriculture. It helped to set up the Alliance for a Green Revolution in Africa (AGRA) in 2006, and since then has spent $1.3 billion on agricultural development grants, largely in Africa. With such resources, solving African hunger could be Gates’s greatest legacy. But there’s a problem: the conventional wisdom is wrong. Food output per person is as high as it has ever been, suggesting that hunger isn’t a problem of production so much as one of distribution. It’s true that African soil fertility is poor, though, which might explain why President Obama feels that the continent needs a Green Revolution. At best, however, the first Green Revolution was an ambiguous success. As John Perkins writes in his magisterial Geopolitics and the Green Revolution, it was instigated by the US government not out of a direct concern for the well-being of the world’s hungry but from a worry that a hungry urban poor might take to the streets and demand left-wing changes in the Global South. The term “Green Revolution” was coined by William Gaud, administrator of USAID in the late 1960s. Referring to record yields in Pakistan, India, the Philippines and Turkey, he announced, “Developments in the field of agriculture contain the makings of a new revolution. It is not a violent Red Revolution like that of the Soviets, nor is it a White Revolution like that of the shah of Iran. I call it the Green Revolution.” Steeped in the cold war, the first Green Revolution was designed to prevent any other revolutions from happening. The Green Revolution appeared successful because the global quantity of food produced increased dramatically. From 1970 to 1990 the amount of food available per person rose by 11 percent, and more than 150 million people were lifted from the ranks of the world’s hungry. But most of that rise was driven by transformations inside China. Subtract China from the picture and the heyday of the Green Revolution saw global hunger increase by 11 percent. In South America, hunger grew by nearly 20 percent despite impressive gains in output driven, in part, by improved crop varieties. Those varieties required large landholdings in order to be economically efficient, which meant that the peasants working that land had to be kicked off. Those displaced peasants migrated to the hillsides and tropical forests, doubling the area of cultivated land–in other words, the increase in food came not only through technology but also simply by having food growing on a greater area. Beyond the massive displacement of peasants, the Green Revolution wrought other social damage–urban slums sprawled around cities to house displaced workers, pesticide use went up, groundwater levels fell and industrial agricultural practices began racking up significant environmental debt. Today, because of the Green Revolution’s catastrophic economic and ecological consequences, even its strong advocates in India have recommended that up to 70 percent of farmers farm organically. Nonetheless, the Green Revolution being prepared for Africa bears more than a passing resemblance to its predecessor. For starters, in the 1960s the push for a Green Revolution was accompanied by fears about national security and stability; the recent global spate of food rebellions, in dozens of countries from Egypt to Haiti to India, has made food a security concern once again. Furthermore, the first Green Revolution was made possible through the philanthropy of a billionaire American family–the Rockefellers; the second is bankrolled by Gates. This is not a superficial coincidence: the destinies of millions of the world’s poorest farmers are again being shaped by the richest Americans, and philanthropic choices are very different from democratic ones. One of the most important choices involves the role of technology. At the Gates Foundation, Roy Steiner emphasized that “we believe in the power of technology.” It’s a belief with clout: about a third of the foundation’s $1.3 billion in agricultural development grants have been invested in science and technology, with almost 30 percent of the 2008 grants promoting and developing seed biotechnologies. Through a range of investments, the Gates Foundation is turning its faith into reality. This reliance on technology to address a growing political and social problem loudly echoes the thinking behind the first Green Revolution. Some of the changes made possible by Gates’s funding are welcome. An African Centre for Crop Improvement has been set up at the University of KwaZulu-Natal in South Africa, which is designed to change the way African agricultural scientists work. Rather than carting them off to Europe or North America, where they learn about the pressing agricultural issues facing French or American farmers, the new center encourages African scientists to face African challenges while based in Africa. Other Gates investments are geared toward training more women PhDs and providing an infrastructure to source food aid locally. These are valuable efforts, but one might pause to ask why the need for such philanthropic intervention arose in the first place. The faltering quality of African agricultural research institutions, and the decline in government spending on agriculture, is a result of the budget austerity imposed by international financial institutions, such as the World Bank, in the 1980s and ’90s. As Filipino scholar-activist Walden Bello has noted, Africa exported 1.3 million tons of food a year in the 1960s, but after being subject to international development loans and free-market fundamentalism, today it imports nearly 25 percent of its food. In a 2008 report, the Bank’s internal evaluations group lambasted the policies that led to this situation. What the Gates Foundation is doing is using its private money to fund activities that once were in the public domain and were, albeit imperfectly, under democratic control. This idea of choice is an integral part of the conventional wisdom about agriculture in Africa. At least until the financial crisis, it was true that young men tended not to want to remain in agriculture if they could avoid it; but that choice was conditioned, in part, by policies that underinvested in rural areas compared with urban ones. One of the consequences of the financial crisis has been to change that field of choices. For the first time in years, men who had migrated to the cities find there’s less opportunity in urban than in rural areas. They’re returning to family land that has been farmed by women, who have developed rich knowledge about agriculture. The technologies that the Gates Foundation funds, like hybrid seed and synthetic fertilizer, require much less know-how than some of the diverse traditional systems managed by women. In many African cultures, women grow the majority of food, but men control access to cash. Rather than supporting and building on women’s agricultural knowledge systems, cash-based agricultural technology allows men with the economic wherewithal to displace women as farmers. African farmers’ organizations have repeatedly rejected this high-tech approach to agriculture and instead are making their own choices. Since AGRA announced its plans in 2006, groups representing the largest farmer federations in Africa have come together in a series of meetings to organize support for African agroecological solutions to the food crisis. Despite institutional neglect, ecological farming systems have been sprouting up across the African continent for decades–systems based on farmers’ knowledge, which not only raise yields but reduce costs, are diverse and use less water and fewer chemicals. Fifteen years ago, researchers and farmers in Kenya began developing a method for beating striga, a parasitic weed that causes significant crop loss for African farmers. The system they developed, the “push-pull system,” also builds soil fertility, provides animal fodder and resists another major African pest, the stemborer. Under the system, predators are “pushed” away from corn because it is planted alongside insect-repellent crops, while they are “pulled” toward crops like Napier grass, which exudes a gum that traps and kills pests and is also an important fodder crop for livestock. Push-pull has spread to more than 10,000 households in East Africa by means of town meetings, national radio broadcasts and farmer field schools. It’s a farming system that’s much more robust, cheaper, less environmentally harmful, locally developed, locally owned and one among dozens of promising agroecological alternatives on the ground in Africa today. It was innovative ecological technologies like push-pull (and not traditional Green Revolution approaches) that were praised by a recent international effort to assess the future of agriculture. “The International Assessment of Agricultural Knowledge, Science and Technology for Development” (IAASTD), a report modeled after the Intergovernmental Panel on Climate Change, took more than four years to complete and relied on the expertise of more than 400 scientists. It was adopted by fifty-eight countries in the global North and South (though not the United States, Canada or Australia). The IAASTD found that a focus on small-scale sustainable agriculture, locally adapted seed and ecological farming better address the complexities of climate change, hunger, poverty and productive demands on agriculture in the developing world. That report–the most comprehensive scientific assessment of world agriculture to date–recommended development strategies that are in large part the opposite of those backed by the Gates Foundation. The Gates Foundation acknowledges the relevance of the IAASTD’s insights. But it continues to invest heavily in biotech solutions to the problem of hunger and gives short shrift to the agroecological approaches recommended by the report. What’s more, there’s empirical reason to doubt whether biotech can deliver what Gates is hoping for. Genetically modified (GM) seeds are expensive, proprietary and contribute to the corporate monopolization of the world’s seed supply. Despite extraordinary restrictions on research into the effects of GM products–the industry refuses to allow independent researchers to study patented seed–evidence is finally emerging of the significant environmental and health risks they pose, prompting the American Academy of Environmental Medicine earlier this year to call for an immediate moratorium on GM food. Prestigious research organizations like the Union of Concerned Scientists have demonstrated that GM crops (which are legal for commercial use in only three African countries) do not increase intrinsic yields, and, in the developing world especially, can increase costs and risks to smallholders, with mixed, often negative effects on their incomes. Although the Gates Foundation has promised crops genetically engineered for drought tolerance, these crops have yet to outperform traditional varieties, according to an assessment by the Australian government. The foundation has also spent more than $111 million to “biofortify” (genetically engineer) crops to have a higher vitamin content, despite past technical and cultural failures that indicate a diverse diet goes much further than genetically engineered supplements in supporting good nutrition. One place where the new Green Revolution has gotten a head start is the small East African nation of Malawi. After a severe drought in 2003, more than a third of the country needed food aid to survive. Bucking advice from the World Bank, the country began giving out vouchers on a large scale for subsidized fertilizer in 2005. The rains returned, yields rose, Malawi began exporting grain and the international community declared the hunger crisis over. The Gates Foundation has been aggressively supporting the funding of fertilizer in Africa through grants to establish a network of private agro-input dealers. While the program doesn’t explicitly subsidize the price of fertilizers to farmers, it encourages national policies to increase fertilizer availability. If the problem for African farmers is soil fertility, funding fertilizer seems unimpeachable. A closer examination of the data raises some troubling questions, though. It isn’t clear whether it was the fertilizer or the rain that caused yields to increase. Worse yet, according to sources in Malawi, hunger has not abated at anywhere near the levels believed by the international development community. This is a concern echoed on the ground. Rachel Bezner Kerr, a professor at the University of Western Ontario, has been working in Malawi for more than a decade. She says that Malawi’s fertilizer subsidies are “masking food security problems for the long term.” Bezner Kerr works with a project in Malawi that takes a different approach to soil health by relying on local farmer experimenters. One village headman has, for instance, encouraged his village to adopt ecological agriculture, which not only improves yields but produces a diverse diet that has improved the health of the community’s children, at a fraction of the cost of Gates’s genetically engineered nutrition projects. Much like push-pull, the result of that project, which spread to more than 7,000 households, is that families–and the soil–are better off. When asked about how AGRA affects projects like hers, Bezner Kerr says, “When farmers get vouchers [for fertilizer], they wonder, Why incorporate crop residues? If AGRA is putting all that money into fertilizer, it is taking away from efforts like ours.” Like Bunch, she’s concerned about the economic as well as the environmental sustainability of fertilizer giveaways. “What happens when AGRA leaves?” she asks. Is Bill Gates Africa’s Latest Strongman? The Gates Foundation responds to criticism of its funding decisions by saying that it is learning all the time, with a state-of-the-art system that will soon let the project officers seek feedback through the cellphones of more than 10,000 farmer stakeholders. It’s unusual in the world of foundations to have such a strong commitment to correcting mistakes. In its flexibility and openness to reform, the Gates Foundation seems ready to depart from the trajectory of the first Green Revolution. Nnimmo Bassey, director of Environmental Rights Action in Nigeria, suggests, “If the Gates and Rockefeller Foundations wish to extend the hand of fellowship to the African continent, they should move away from strategies that favor monoculture, lead to land grabs and tie local farmers to the shop doors of biotech seed monopolies.” This is feedback that can’t so easily be shot back to base through a cellphone. The calls from African organizations to be able to set the agenda for their own agricultural development are heard only faintly in the United States. That’s largely because when it comes to African hunger, prejudices about the incompetence of African farmers and the marvels of biotechnology do a lot of the thinking for us. But the Gates Foundation isn’t a victim of poor reasoning. It actively promotes an agenda that supports some of the most powerful corporations on earth. Far more than the peer-reviewed IAASTD study, Gates’s strategy reflects another report, funded by the foundation itself: “Renewing American Leadership in the Fight Against Global Hunger and Poverty” from the Chicago Council on Global Affairs. 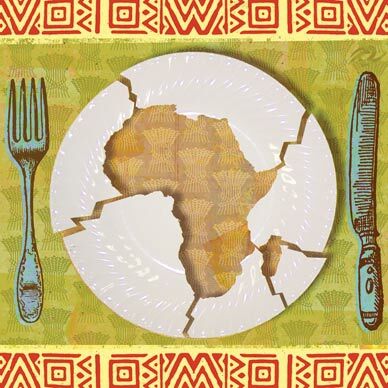 Knocked out in a couple of months by a small team led by a Gates Foundation senior fellow and stacked with staff from institutions receiving substantial Gates money, the report, while rightly calling for renewed investment and education, again ignores the structural and political causes of Africa’s hunger, ascribing it to a technical deficit. The report concludes that the United States needs to “reassert its leadership” in “spreading new technologies,” because it will increase trade and “strengthen American institutions.” Worse, the council’s solutions–with classic Green Revolution hubris–ignore the successful endogenous solutions that have been spreading across the continent for three decades. Rarely in the history of philanthropy has one foundation–or more correctly, one man–had this kind of power. When Obama made his remarks on the Green Revolution, one Seattle Times journalist suggested that “President Obama and other world leaders seem to be taking their cue from the Gates Foundation.” It’s not hard to see the paths through which the thinking in Seattle might have made it to Washington, DC. Many AGRA and Gates Foundation employees are former industry and government insiders. Rajiv Shah, a doctor with no previous agricultural experience who was headhunted by the Gates Foundation, is now at the Department of Agriculture, as under secretary for research, education and economics, and also chief scientist. The foundation’s reach extends far beyond Washington. With billions committed to agricultural development, the Gates Foundation has a financial heft equal to that of a government in the global North. In 2007 the United States contributed $60 million to the system of international public agricultural research centers. Gates has pumped $122 million into the system in the past eighteen months alone and given a total of $317 million to the World Bank. Africa’s Green Revolution has another similarity with the first Green Revolution: the technological preferences of the philanthropist shape the approaches on the ground. For the Rockefellers, that meant agricultural technology based on industrial chemistry and oil. For Gates, it’s about proprietary intellectual property. Africa’s Green Revolution is, in other words, just a new way of doing business as usual. In its push for technological solutions, its distaste for redistributive social policy and disregard for extant alternatives–as well as in the circumstances that have made food an international security concern–this Green Revolution looks very similar to its predecessor. The biggest issue, however, isn’t one of commission but of omission. Just as in India, where peasant demands for land reform in the 1960s that might have led to more sustainable and durable progress (as such reforms did in China, Japan, Taiwan and South Korea) were ignored, African farmers advocating their own solutions to the food crisis are being marginalized. In particular, the vocally articulated demands–for agroecological alternatives, state support for farmer-led research, for land reform, for women’s rights in agriculture, and for sharing access to water–all fade into the background when Gates’s answers are amplified. It will take a suite of policies, addressing both the technical and sociopolitical reasons for hunger in Africa, to make lasting change. Technologies for development need to be accompanied by other, political reforms, including canceling debt, removing food and agriculture from the World Trade Organization, investing heavily in farmers’ organizations and their proven sustainable agricultural technologies, and supporting the peer-reviewed approaches generated by the science of agroecology. Models for this kind of change already exist. In Mali, peasant movements have successfully persuaded the government to adopt as a national priority the idea of “food sovereignty,” a shorthand for the democratization of the food system. Similar efforts are happening at regional and local levels in other countries. But for those initiatives to register in the United States, the conventional wisdom regarding the Green Revolution needs to be replaced. The tragedy here is not that Africa hasn’t had a Green Revolution but that the mistakes of the first may be repeated once more, and that one foundation has the power to make the rest of the world bend to its misguided agenda.